The Center for Energy Workforce Development (CEWD) received a $1.37-million grant to train young adults using the Get Into Energy Career Pathway Model. The CEWD received the grant from the Bill and Melinda Gates Foundation to prepare low-income, young adults in eight states for careers in the energy industry. 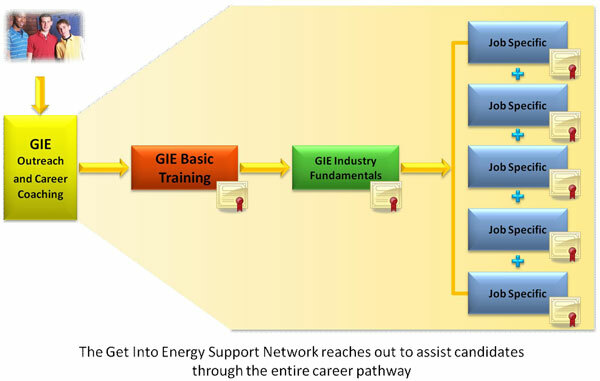 The Get Into Energy (GIE) Career Pathways Model provides a roadmap for entry into skilled utility technician positions in the energy industry with pathways to higher level jobs in a variety of work settings. The pathways model focuses on the needs of three stakeholder groups: students and potential applicants; educators; and employers. The system is divided into key modules supporting these stakeholders, including GIE Outreach and Career Coaching, Career Pathways Curriculum and Stackable Credentials, and Employer Collaboration and Support. Indiana and Minnesota will work with 5,000 low-income, young adults (ages 16-26) to assess their interest and skill levels for potential employment in skilled technician positions. Students will have an opportunity to earn “stackable credentials” through the project that focus on the foundational skills necessary to be successful in a variety of positions in energy. The program will use the “Get Into Energy Career Pathway Model,” which might include boot camps, apprenticeships, certificate programs or an associate degree. Roughly 500 participants will be placed into electric and natural gas utility jobs. Others will be referred to jobs in construction and manufacturing.